Buy with confidence for quality and service. Adidas Originals t shirt Men's White California Retro Crew Neck Short Sleeve XL. Condition is As new. This was bought and tried on but too big. Dispatched with Royal Mail 1st Class. Navy blue which have not been worn at all,has no tags as son took them off before trying it on and it never fit him. Adidas Newcastle Strip Shirt. Size Small. 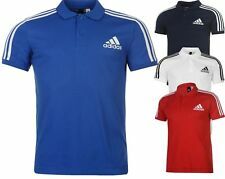 Adidas Man's 3 Stripes Logo Polo Shirt White Medium M. Men's polo shirt 2 button placket Regular fold down collar Short sleeves Ribbed cuffs Regular fit Cotton pique Three stripe design adidas branding 100% cotton Machine washable Condition is Used. Worn once. Dispatched with Royal Mail 2nd Class. If you require any further information please let me know. Thank you! Adidas Originals t shirt Men's California Retro Crew Neck Short Sleeve S M L XL. Condition is Used. Dispatched with Royal Mail Signed For® 2nd Class.